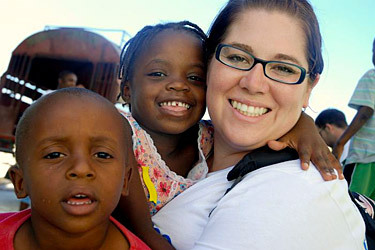 When a massive earthquake devastated Haiti this January, one PUC alumnus was especially touched. Nicole Wilson, class of 2006, had just returned from the impoverished island nation, where she and a group of Christian missionaries had been ministering to the medical, social, and spiritual needs of the people there in the wake of several hurricanes last year. This most recent disaster has served as a call to this missionary, who is now in the process of developing an international organization devoted to providing care to people living in underdeveloped countries. Wilson plans to open the organization’s first center—which will contain a clinic, orphanage, and learning center—in Haiti, a place that has grown very close to her heart. After graduating from PUC and earning a MS in health science and education, Wilson started training to become a physician’s assistant at the University of California, Davis. The training served her well last year during her first trip to Haiti with a non-denominational Christian mission group called God’s Chosen Ones Ministry (GCOM) International. “We were able to see over 500 patients in those ten days,” she says. “We had a ton of complaints.” Those complaints ran from sun damage from exposure to more serious wounds. And in the aftermath of last year’s hurricanes, infection was everywhere. “They only have dirty water to wash with, so they get perpetual infections. You’d get complaints from kids as young as four all the way up through the elderly.” Add to this the scarcity of medical resources—wounds are being bandaged with trash bags, and ibuprofen there costs two dollars a pill—and it’s a recipe for a medical crisis. Just two weeks after the group returned stateside, last month’s earthquake struck the already-reeling island. Sadly, many of the very people that Wilson had just served were lost. An orphanage they had visited sustained major structural damage. Wilson contacted GCOM and signed up to return to Haiti in March. She’s bracing herself for the worst. “It’s gonna be a whole different ballgame now,” she says. “I don’t know what we’ll see—probably a lot of infections. I hear they’re doing 70 amputations a day in Haiti as a result of the disaster.” Besides the medical care the group anticipates providing, they will be collecting and distributing supplies like food, tents, and clean water—as well as something less tangible. The initial planning stages of the project are complete and they plan to have a fundraising campaign and website operational next month. “It’s exciting, because I’ve always wanted to do it and now it’s actually going to happen,” Wilson says.